Locksets are available in nine designer finishes to compliment many architectural themes. All finishes are appropriate for both interior and exterior installations. 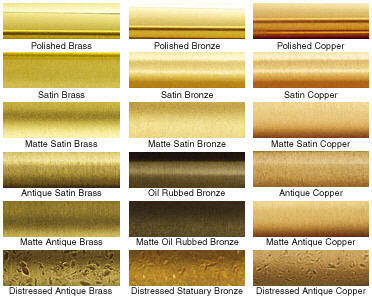 Polished Brass - Traditional American finish, simple, honest, strong. Highly polished brass is protected with a glossy protective coating of lacquer. 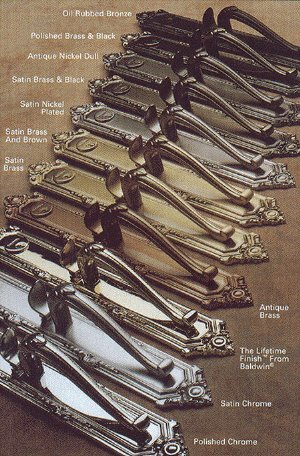 Antique Brass - Stylishly displays the skill of the craftspeople who buff a graceful pattern of dark relief lines into every component. Protected with clear, gloss, lacquer. PVD Lifetime - Looks like polished brass but achieved by plating the underlying brass part with nickel, chrome and titanium resulting in a highly durable and corrosion resistant surface. Slight reddish tint compared to real polished brass. Pewter - Makes a strong designer statement useful in rustic and country settings. Nickel plated brass is hand relieved and protected with a flat coating. Oil Rubbed Bronze - Evokes a feeling of bronze statuary and aged elegance. Copper plated brass is hand relieved in a pattern consistent with natural wear. Polished Chrome - Useful for achieving a modern look and for matching bath hardware. This is a highly durable finish excellent for high wear or corrosive environments. Satin Nickel - Traditional American Victorian finish currently enjoying a revival. Excellent for suggesting a period look. Less reflective than polished chrome, and with the character of hand made finishing marks intentionally left in the surface. Satin Steel - The look of well used antique steel without the rust. This finish is protected by a zinc coating laid down on top of a distressed steel surface. Flat Black - A traditional wrought iron appearance achieved with a heavy layer of zinc for corrosion protection. Excellent for Mediterranean and Colonial themes.